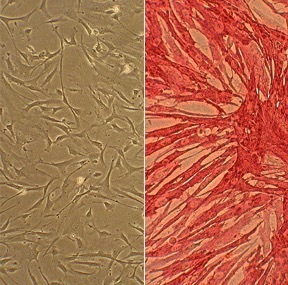 Human Internal Thoracic Smooth Muscle Cells (HITASMC) are derived from the normal internal thoracic arteries (formerly called internal mammary arteries). HITASMC, along with Human Coronary Artery Smooth Muscle Cells, both from Cell Applications, Inc. have been used to investigate the gene expression differences between smooth muscle cells from different arteries, underlying their differential response to injuries and proliferation stimuli. (Click to Enlarge) Human Internal Thoracic / Mammary Artery Smooth Muscle Cells: HITASMC. Cells isolated from the vessel that supplies the anterior chest wall and breasts. Lange, M. 2013. Artery Specific Differences in Cell Cycle Regulation are Associated with Serum Induced Proliferation of Vascular Smooth Muscle Cells. MSc dissertation, University of Applied Science Bonn-Rhine-Sieg. Seymour, K., B. Sadowitz, J. Stein, J. Lawler, K. Maier, and V. Gahton. 2011. Vascular smooth muscle cell migration induced by domains of thrombospondin-1 is differentially regulated. Am J Surg, 202:553-557.